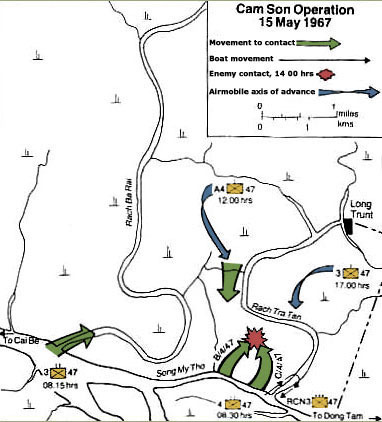 4th/47th's First Battle in the Mekong Delta. . .
heavy fire. By 1630 hours the enemy was observed to be moving to the northeast. One company of the 3rd/47th was airlifted into blocking positions at 1700 hours but no contact was made. By 2000 hours, all firing had ceased and the action was broken off. This operation emphasized the difficulties of manuerving boats in restricted waterways, particularly in periods of low water. It was also revealed the vulnerability of trrops in assualt boats to rocket fragments. Lastly, it vividly demonstrated the elusiveness of the enemy and his ability to break off an engagement and disappear into the countryside. These problems became regular features of MRF operations.